Welcome to our Easter Parade! a time we celebrate hope and renewal! 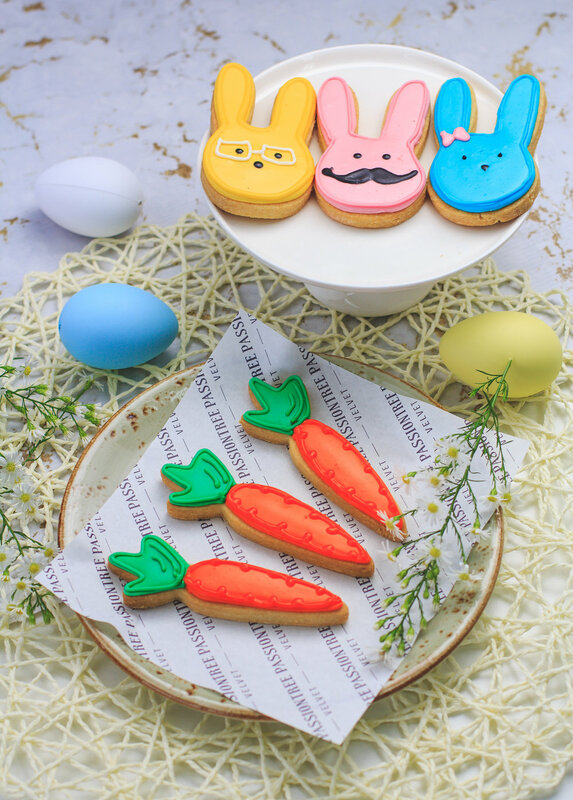 Gather your family and friends and spend some quality time this Easter with our Easter Parade Cake as well as some bunny and carrot royal icing decorated shortbread biscuits (great for the kids). Inspired by chocolate Easter eggs, traditional pastel Easter colours of blue, yellow and pink, we have created our Easter Parade cake featuring 53% dark chocolate American sponge with white chocolate ganache, decorated with pastel piped buttercream and pastel Easter eggs, topped with a royal icing decorated shortbread bunny biscuit. With all our festive cakes, we draw inspiration from each event to create special cakes and desserts for our customers. This year, our colour palette is based on pastels, known as the The “Colours of Spring”, symbolising a celebration of the season of renewal and the blooming of the earth and flora appearing in a breathtaking exhibit of colour. Our Easter Parade Occasion Cake captures this notion with pastel buttercream piped like blooming flowers and stars on the surface of the entire cake in all shapes and sizes. And, of course, keeping to our Easter tradition, we also added some pastel Easter eggs! You can view and pre-order our limited edition Easter Parade Cake here! Only available from April 11th until April 18th across all our stores in Brisbane, Gold Coast, Sydney and Canberra. Passion Tree in Chatswood, Sydney, Whats the Difference & How is it Related?